Post Oak Traffic Systems travel time monitoring technology is based on the use of Bluetooth, a robust, low power, and low cost wireless communications method. Bluetooth technology is standardized and used worldwide, so that Post Oak Traffic Systems equipment may be deployed anywhere in the world. Post Oak’s Anonymous Wireless Address Matching (AWAM) System detects vehicles equipped with enabled Bluetooth networking devices, including cellular phones, mobile GPS systems, telephone headsets, and in-vehicle navigation and hands-free systems. Every Bluetooth device has a unique 48-bit address, known as a MAC address, used to identify it to other network devices. 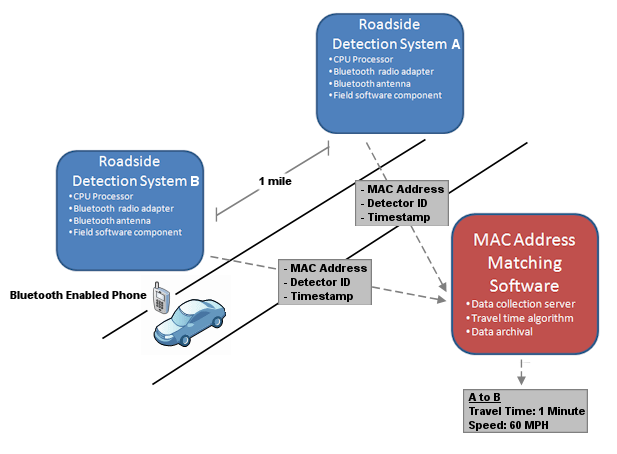 Each AWAM reader senses MAC addresses emitted by enabled devices as they pass the reader station. The reader then stores the MAC address and can eliminate duplicates so that less bandwidth is utilized in the communications path. For real-time applications, the AWAM reader then transmits the time and location of the device to the AWAM host processing system. As probes are detected at successive AWAM readers, the host system calculates average travel times and speeds for a roadway segment. For post-processing applications, the AWAM reader stores the MAC address, timestamp and location locally for later processing.